Tired Wolf Massage Therapy started in January 1995. You are looking at a picture of my studio. It is located in our 1885 Victorian home, and is over 300 square feet. The studio is equipped with a sound bar surround sound system, individual air conditioner and heat controls, home made scented candles, and a fully electric table which lowers to 17 1/2 inches from the floor so you can easily get on to and get off of the massage table. Active isolated stretching can be incorporated into a massage or used as a stand alone therapy. AIS can be of tremendous value we can stretch muscles that are not accessible by massage. Long strokes, pressure will vary as per each client. Foot massage, I have over 100 hours additional training in just foot massage. An approximately ten minute foot massage is included in each one hour Swedish massage. CranioSacral Therapy involves light touch, about the weight of a nickel, on the client. The therapy works on the premise that a slow, longer lighter touch causes the body to respond. CranioSacral involves only the spine and head and is practiced with the client fully clothed. The results can be astounding with this technique. Great for sinus trouble and blocked ear canals. Works specific areas of pain and can be a effective technique in relieving muscle tension. Massage with warm stones is included in for all massages. I massage with these warm stones use less pressure and are extremely effective in relieving areas of tension. Warms stones may also effective for sinus congestion. 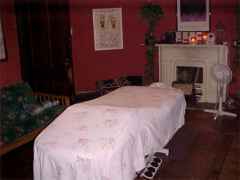 The majority of my practice is in house but I will give quotes for outcall and office massage on an individual basis. Are available for every massage modality. Click here if you would like to buy a gift certificate.